Maximize your office space at home or work with this handsome office desk solution from Bowery Hill. The Professional Office Collection combines 4 separate pieces to give more room to work and be productive. Plus, multiple storage compartments and shelves on the hutch provide lots of space for all your office supplies, files, books, magazines and more. Grommet holes can be found on all sides of the desk, credenza and bridge, allowing you to organize and conceal wires. In a classic cherry and gray finish, the Altra U-Shaped Desk Solution not only looks good, but also provides a durable and water resistant work surface. 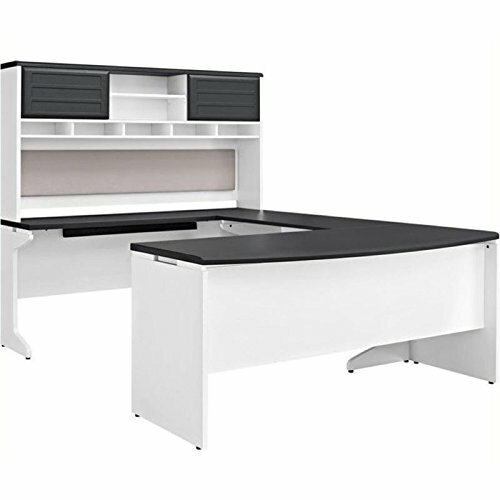 If you love the look and convenience of this desk, be sure to check out Altra's additional matching pieces from the Collection, including file cabinets, meeting tables and more (each sold separately). Measures 65"H x 66"W x 95.5"D. Features: Closed and Open storage keep office supplies and paper organized; Work-in-progress slots organize papers; Fabric pin board holds notes and important papers; Hollow Core Construction; Wire management slots on all sides of desk; Large work surface; Bundle is made up of 1 Executive Desk, 1 Credenza , 1 Bridge and 1 Hutch.